Bahdja Selhi was a Global UGRAD from Algeria who attended Castleton during the Fall of 2016. She is currently in Lebanon, pursuing a graduate degree in Migration at the Lebanese American University in Beirut. 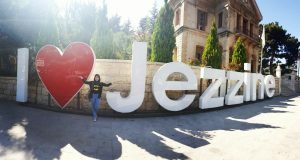 Before this she co-founded Shaping Young Algerian Minds, an educational NGO, and has worked with her community on youth education, bringing lessons on leadership she learned from her time in the states. The following is a reflection on her time here at Castleton. A year ago, I got a scholarship to study one semester in the US as an exchange student. As with most international students, and because we mostly only hear about NY or DC, I wished that I would study in one of these two big cities. However, a few days later, I received an email from Castleton. It was my first time noticing this name. The only source that I had to know about this place was the Internet, so I checked it on Google and found many beautiful landscape images. I started wondering. How can a girl who lived her entire life in a small town in the desert of an Arab country, travel to study in a snowy town uphill the mountains in another continent? How is the culture there? What about the people? And countless questions. Every night, I used to imagine and dream about everything that would be there. I drew my own wonderful picture of Castleton. Days later, the imaginations became real. I was an “international student” at Castleton University. The journey then began. I still remember the first day when I opened my eyes in a different room filled with marvelous theater stuff that belonged to my roommate, and I realized then that I was not home. I was so tired because of the longest trip I’ve ever taken. I sat there wondering and looking around; everything seemed odd for me. After few minutes, two friendly girls knocked my door and invited me to explore the campus and meet other international students. With curiosity, I went out with them leaving everything as it was, my luggage even unpacked. We walked outside, and the first thing I noticed was that it was all green, I was flabbergasted. This looked like heaven on earth for me. The whole campus was astonishing, and I was I extremely eager to explore every corner of it. I still recall how excited I was, taking MANY photos and meeting other students. After a week, the semester began. I attended classes and discovered the academic system. It was very different and flexible, and I loved the whole program. The professors were comprehensive, they helped me a lot and took my situation into consideration whenever I struggled to understand something that was common knowledge to the American students. Before I traveled, and since it was my first experience, I was kind of concerned about how I’m going to adapt there. I surfed through several blogs, and one of the common terms discussed were “homesickness,” it made me feel a bit worried, but in fact, this wasn’t a big deal for me when I got there because Castleton gave me another home and a new family. Homesickness was not all that I came across. One of the repeated tips that I found was that international students should not be shy, otherwise they won’t be able to make friends. Although I read this, it was hard for me to open up at first because we had so many differences and I wasn’t aware of the culture, but actually, people at Castleton accept you regardless of your background. They try to understand you, respect you, and love you just the way you are. Eventually, I became more easygoing. From looking at differences as a hurdle, I found myself discovering several similarities. And I learned that both of them are what shape those unique lifelong friendships between people from all walks of life. I had the chance to get to know many people from different countries such as Nigeria, China, Nepal …etc, and because of the i-seminar, organized by the campus, I could learn more about them and try their traditional dishes as well. The university also used to plan trips for the international students once every two weeks. We visited various places, tried new things, and had so much fun together. This great university means a lot for me. It’s the place that holds my best memories, and most importantly, the beautiful souls whom I met, the ones who made my experience fabulous. I had friends who prepared for me hot cups of tea and made me forget about my illness when I once fell sick. They organized an amazing party for us, the UGRADERs, they prepared delicious food, gave us beautiful Christmas gifts, and played with us funny games. And of course I can’t forget my best friend who made my Halloween experience unforgettable along with many other splendid days. 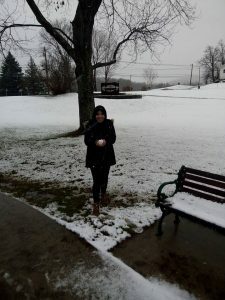 One of the reasons that I traveled to the US was not only to study, but also to explore its culture, and Castleton was the perfect place to do so. Traditional and religious celebrations are highly valued there. And as I mentioned above, professors were always kind and helpful. One of my favorite lecturers Mr. Supernovich, invited me to Thanksgiving dinner which had a special charm. This gave me the chance to learn more about American families and traditions. After an incredible semester, I came back home inspired and eager to make a positive change in my society. I co-founded a non-profit project called “Shaping Young Algerian Minds” where I shared the skills and the knowledge that I gained from my experience at Castleton University. It is a leadership and educational project that aims to empower inquisitive teenagers. Although Castleton was chosen for me, if I went back in time, and was given the chance to choose, I would definitely go for Castleton University again. And I am so glad that I got the opportunity today to write something about this place and reveal what hides behind the digital photos, because although Castleton as a town is captivating, I also believe that its people, their spirits, and the culture are more fascinating.